A while back, I put out a call to Twitter asking for tips on important works in artistic criticism. As a student of history, my strongest inclination when studying something is to examine the events that preceded it. In hopes of understanding fruitful ways to critique games, I find it helpful to examine the structures of discourse from other mediums. This way, it is possible to borrow what is useful, learn from what has failed, and discard what is superfluous. In many ways, the critical space of video game analysis feels like a wild frontier, and this post is my first effort in obtaining a map of this strange new place. I am trying to walk that thin line between self-important intellectualism and practical analysis, so bear with me if things get messy. Critical works from other mediums will never yield perfect matches, but that does not negate the lessons learned. To this end, I will dive in head first: What can Aristotle's Poetics teach us about games? This was the first time I had read Poetics1, and I was astounded at how applicable Aristotle's thinking is to even the newest of mediums. While not all of his rhetoric is as spry as it once was, there is a reason why his work remains relevant. 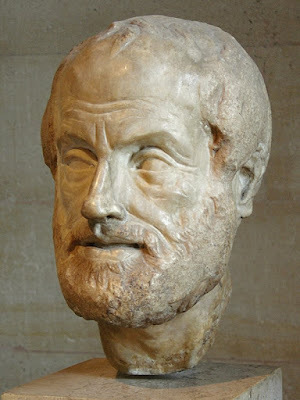 While one could dedicate their lives to understanding and dissecting Aristotle's Poetics (many have), for the purpose of this post I will focus on two major concepts Aristotle discusses and describe how they can help us understand and analyze video games. Aristotle argues that the existence and enjoyment of poetry arises "from two causes, each of them lying deep in our nature" (15). One, "the instinct for harmony and rhythm" seems more applicable to poetry than video games, although the influence of harmony and rhythm should not be underestimated. One could argue for the existence of metre and verse in games as well, but that is a discussion for another post. Aristotle's other explanation for the existence of poetry speaks not only to why people enjoy video games, but more importantly, why the medium itself is intrinsically valuable. Aristotle holds that the basis of poetry is imitation; imitation of people, nature, emotions, of existence in general. Because "imitation is implanted in man from childhood," (15) "everyone feels a natural pleasure n things imitated. There is evidence of this in the effect produced by works of art. Objects which in themselves we view with pain, we delight to contemplate when reproduced with absolute fidelity: such as the forms of the most ignoble beasts and of dead bodies" (15). Like poetry, video games delight us by presenting representations of the mundane and the fantastic, challenging us to understand the representations. Something as pedestrian as a bale of hay delights us when it appears in a game like Flower. While it would normally be terrifying to see a killer worm the size of city, Gears of War 2 makes it a treat. Aristotle, reasons that the pleasure derived from imitation is actually produced by the learning process that occurs during the consumption of poetry. After all, "to learn is a lively pleasure, not only to philosophers but to men in general...Thus the reason why men enjoy seeing a likeness is, that in contemplating it they are engaged in learning,--they reason and infer what each object is: 'this,' they say, 'is the man.' For if you happen not to have seen the original, the pleasure will be due not to the imitation as such, but to the execution, the colouring, or some such other cause" (15). Here, Aristotle may be used to elegantly argue for the merit and importance of games as an art: as they are imitative, they inspire players to think critically about what is being represented. Whether it is a physical entity, like a city in Grand Theft Auto, or something thematic like the sense of loneliness in Ico, the material being imitated must be given meaning by the person playing. Playing a game utilizes the same skills that, according to Aristotle, make poetry and plays high art. The audience and the player are rewarded by learning to understand both the imagery and the rules governing the art's composition. In discussing tragedy, Aristotle asserts the Plot as the "first principle" (27) of a great work, to which all other aspects (setting, characters, props) are subordinate. He argues that plot of a truly great tragedy must be "so constructed that, even without the aid of the eye, any one who is told told the incidents will thrill with horror and pity at the turn of events" (45). While not the definitive way to evaluate a game, an Aristotelian hierarchy can help identify which pieces of a game are most important. This line of thinking can be modified to examine a game's structure. In the case of games, Aristotle's basic reasoning may be used if the primacy is shifted off of the plot and on to the gameplay. At its most basic level, a game can be called a set of rules with which a player interacts with. The combination and execution of said rules make up gameplay. While a game may have an explicit narrative, detailed graphics, and vivid characters, it is the gameplay that distinguishes it from a film or book. Aristotle challenges us to strip a tragedy of it of its characters, setting, and props and see how well the plot stands on its own. In this way, we can measure the greatness of a work. A similar mode of analysis may be applied to video games in terms of the gameplay. For games, the Aristotelian "plot" is actually the gameplay: Pong and can be dressed up in many ways, but their essence, that is to say their basic rules, make them great. Not all of Aristotle's philosophy fits snugly with game criticism. The world is in many ways a vastly different place: plays no longer last the whole day, modern psychology has complicated Aristotle's inflexible hierarchy of beauty, and technology has opened possibilities classical philosophers could only dream about. Much of Aristotle's writing has been lost to the ages, and some of its meaning has been obscured by time. Notice I did not attempt to address one of the most controversial topics in Poetics: catharsis. Perhaps the idea of building up an emotion and then purging it applies to games as well? The terror of fighting a zombie hoard or the sorrow losing Aeris are satisfying on an emotional level. However, Aristotle's own ideas on this concept are vague, and I am hesitant to build my already flimsy house on such ancient, shifting sand. What is clear is that the rubric of high art according to one of the giants of European thinking can be used to evaluate video games in spite of their relative youth as a genre. Aristotle gives the plot of a story precedence over all other elements. In the case of games, the "plot" represents the gameplay, as rules are its basic structure. Within every great game is excellent gameplay capable of standing alone after the baubles of technology and characters are removed. Most importantly, Aristotle provides an elegant way of defining the allure and the redeeming value of art: in imitating life, it stokes the thirst for knowledge. If we were to ask Aristotle whether games, like poetry and theater, can be art, he might ask us whether they invite interpretive reasoning in their audience. Do they make us think? We would say yes, and he would say that we have our answer. 1. In this post, citations refer to page numbers in, Aristotle's Theory of Poetry and Fine Art, With a Critical Text and a Translation of The Poetics by S.H. Butcher. London: Macmillan and Co., 1895. Great blog and interesting analysis. I design games, which is different from critiquing them, and from my point of view you missed a few points of how poetics can be applied to game thought and the field of game design. Catharsis (which you touched on but didn't delve into) is a very strong element of game experience. Much more so then it is in more passive media. You could argue that games, and the direct experience they offer, bring Aristotle's vague definition to life. The other major point of Poetics which was not addressed was his concept of story objects: agents (whether characters or inanimate objects) and how they influence action. The agent / action aspect of Poetics offers a great framework for thinking about and making games.